Mount Adams Resource Stewards (MARS) is a small, non-profit, community-centered organization that deals primarily in the realm of sustainable forestry and rural economic development in the greater Mount Adams region — although the organization often works outside of those parameters. Founded in 2003 in response to growing concerns about rural decline and the rapidly decreasing profitability of the timber industry, MARS has worked to preserve local resources and economic opportunity, inspiring productive communities in working landscapes. At the core of MARS’ mission is the belief that by connecting communities to the lands and resources that surround them, a wide-reaching ethic of sustainability and effective community resource management can be achieved. By including community voices, partnering with state and federal agencies, and cooperating with analogous non-profit entities, MARS works with a diverse assortment of interests to support the maintenance of healthy, productive ecosystems, stimulate local economies, and ultimately create healthier landscapes. In many respects, MARS is at the forefront of forest management in the American West. This is best exemplified by their implementation of a community forest land use model and the reintroduction of fire into forests through prescribed burning. The community forest model, designed in-part by MARS, places a value on entrusting local rural communities to manage forest lands, allowing for continued public access, healthy and sustainable landscapes, and community economic stimulus. 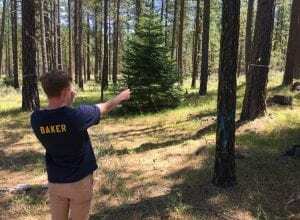 While the relationship between forests and economics is often viewed as dichotomous in the United States, the community forest management plan provides flexibility that allows for commercial thinning operations that are profitable for local loggers and are important for achieving healthier forests. Through this management plan, MARS has been able to walk the thin line between environmentalism and rural economic support; an uncommon feat in the last few decades. Another area of focus for MARS is improving is climate resiliency in forests through the implementation of prescribed fire. Before the era of fire suppression and consequently, megafires, fire was a healthy component of all forest systems. In the last few decades, however, the population inhabiting the wildland-urban interface has drastically increased, leading to greater fire suppression, a phenomenon that has contributed to millions of acres of unhealthy, vulnerable forestlands. By introducing fire back into landscapes in a mild, controlled fashion, MARS has been able to protect against the growing threat of megafires, while allowing the forest to assume a more natural existence. This summer at MARS I have primarily been conducting research on the feasibility of applying Biochar as a soil amendment in forest stands to increase the water holding capacity of soils. 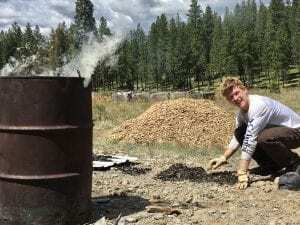 Biochar is created through the process of superheating a recalcitrant carbonaceous material such as wood until a pure carbon product is created. Similar to regular charcoal, biochar simply exists in a purer form (with little to no ash or CO2 released during its production). If a significant positive correlation between its application and soil water holding potential is identified, biochar could prove to be an effective tool to improve climate resiliency and protect against drought and forest fire. While my research centers primarily on the effectiveness of the application of biochar in a forest setting, I also hope to create a plan for the implementation of a biochar operation that turns wood waste and slash into biochar so it can be spread on-site. In addition to this, I am following up on my efforts last summer to help create a comprehensive beaver reintroduction plan for Klickitat County. Reflecting on my internship experience at MARS, I am thankful that I have had the opportunity to work for an organization that continuously searches for creative solutions to the problems that pose a threat to Western landscapes and communities. I am thrilled to be a part of a team of passionate, dedicated individuals who truly care about the people and the lands that surround them — people that care about the future of the western United States. Since we still live in an era where climate change is publicly denied, where public lands are increasingly privatized, and where resources are extracted without concern for the environmental consequences, we must support organizations like MARS.